~Heat oil in a deep fryer or heavy bottomed pan to 375 degrees F (190 degrees C). ~Sift the flour, salt, and baking powder into a medium bowl. 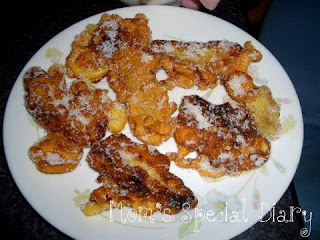 ~In a separate bowl, mix together the bananas and sugar. Gradually mix flour mixture into bananas, stirring until well combined. ~Drop batter by spoonfuls into hot oil and cook turning once until browned 2 to 8 minutes. Drain on paper towels. Uyyy sis nakakamis naman ang maruya mo, I miss the banana q, turon at iba pa. Buti nman mn saging diyan angsarap nmn niyan. Uy maruya! I used to sell that during basketball league in my cousin's hometown. masarap yan! great with coke. I remember having maruya for merienda when I was a child. Been a long time. Hope to make one to share w/ my daughter. Maruya,yummy meryenda every afternoon,galing mo naman gumawa. sarap! try ko magluto ng maruya tomorrow. thanks for the recipe ate!